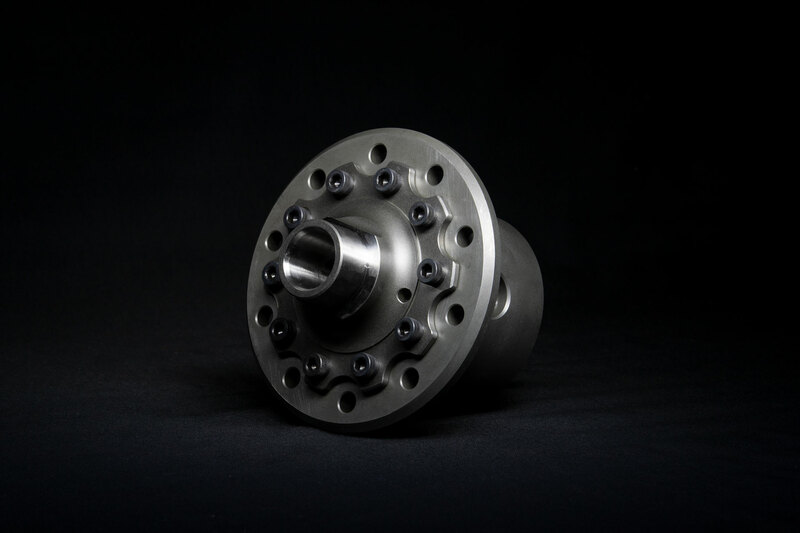 In order to fully justify the benefits and pricing of our very own limited slip differential (LSD), a few explanations are necessary. To do so, we have to access the three main components and characteristics of a LSD. There are various LSDs (e.g., TITAN, Tran-X) on the market for the Caterham Seven, each of which rapidly lose preload or have a largely undefined preload. Determining preload of the disk pack is crucial to performance for various reasons. A LSD which has lost preload will make unsettling noises when slowly cornering. This is due to the plates being able to move freely within the differential, thereby causing rattle. This is of course of great importance for use in road traffic, which is why we implement helical gears in our Quaife Automatic Torque Biasing (ATB) LSD applications. However, these barriers have unfortunate design-related disadvantages, such as freely-spinning when suddenly decelerating on a wet road, as well as spinning the unloaded wheel while it is in the air (something which constantly occurring on a track day!). With an ATB, you cannot correct your steering so well with use of the gas pedal / drifting. If you take these disadvantages into account, then the ATB becomes a cheap and wear-free alternative to the product presented here. This is mainly because this type of construction does not fully lock, which pushes the driven torque of the wheels back and forth, reducing the tendency towards understeering and making the vehicle easier for an amateur driver to control. The basic locking value of the LSD lock will be specified based on the preload of the plate pack. Now you might think that the basic lock value is not so important when dealing with a race car, as the maximum locking force will be applied at full load regardless. However, it is also important to consider that the two driven wheels are connected to each other and do not allow speed compensation under preload. It is for this reason that one should consider a low preload for a lightweight Seven in order to avoid understeer in slow corners. Most importantly, one would like to completely avoid understeer during slow curves whenever necessary. On the other hand, especially with the lightweight Seven, you need a high locking value when accelerating to ensure that the unloaded wheel does not spin freely, which would result in a loss in traction and valuable time (this would also be annoying in a road-going car and destroy driving fun). This is however not the case, as a preload-free plate pack in conjunction with a high locking value is difficult for most driver’s to control, since the vehicle will now react very aggressively to any load changes. Load changes are especially provoked when you explore the best grip in turns with use of the throttle (Wheel load shift / grip break). This is why it is important to rely on setting a correct preload. Otherwise, you will lose crucial lap time in faster corners when the grip on the rear axle is lost, causing you to let off the gas to focus on correcting oversteer. For this reason, the Titan locks, which are mandated by the British Caterham racing series, must be revised up to twice a year to ensure the correct bias. It's easy to figure out what this will cost every time in terms of time and money: remove the differential, remove the lock, rebuild the lock, and then reassemble everything. That's about a day's work plus the cost of replacement parts. It is at this point where the benefits in terms of the overall construction of our LSD fully comes to fruition, as our lock is designed to constantly retain the preload. The is achieved with the use of so-called spring plates. Each high-quality spring plate has a specific material thickness and curvature for a certain working range/travel. Normally, if this range is exceeded, then the spring will remain permanently overstretched or completely break. For this reason, the manufacturers of high-quality disc springs specify a maximum working travel / spring travel in relation to their curvature and thickness. Now one should think that these specifications are respected by the manufacturers of various locks. But this is not the case. The construction of the LSD should not only be suitable for a light Seven, but also for a heavier touring car. Therefore, different material thicknesses and bulges of the spring plates are used in the LSDs. Since we only use locks for lightweight Seven applications, we of course know the ideal spring plate suitable specifically for our implementations. This means that we know the maximum spring travel of our spring plate and limit this as the only constructive. For this reason, our spring plates can never become lame. Because our lock is only used solely in the Seven, the available quantities are of course much lower, which has negative effects in term of overall initial production costs. However, one must consider that our alternative will offer significant advantages once the first revision/rebuild will be required. This makes our LSD a much more sound investment in the long run. Another aspect are the ramp angles of the pressure rings. It can be generally said that the flatter the ramp angle of the differential axes mounted in it, the higher the locking degree. In road traffic 45° and in racing somewhat flatter angles of approx. 30-35° have proven to be effective. Over the years, we have repeatedly experimented with various even and uneven ramp angles. However, due to the fact that our Sevens always run tyres with a high-level of grip, along with a nearly 50/50 weight distribution and 4-cylinder engines, the drag torque when we take the foot of the throttle and braking is negligible. LSD with 0° ramp angle in acceleration mode open, making rear axle-feel less noticeable when braking. We have therefore come to the conclusion with many experienced test drivers that ramp angles of 30° on the pull side (when accelerating) and 30° on the push side (when decelerating or braking) have proven very successful for all our applications. These experiences were already made in the 1990s with the ZF LSDs. Unfortunately, these specific LSDs have not been produced for many years, with the final iteration of these units being found in many Caterham cars in the generations before the R 300 / 420R. When considering various LSDs for the Seven, it is definitely worth taking a close look at this ZF lock. ZF supplied these LSDs to various large-scale manufacturers, which is why production costs had to be kept within strict limits. In the ZF locks which were used in the Seven, only one "active" inner lamella was installed on each side, which had a direct effect on the pressure ring and the passive outer lamella. These OEM ZF locks were only available with 45°/45° or 30°/30° ramp angles. In short, one can say that a 45° ZF lock with the ZF disk package in a Seven with over 150 hp locks far too little, causing the relieved wheel to hopelessly spin around and thus traction is lost. This can be seen again and again with the 45°/45° ZF locks which one encounters in left-hand drive CSR racing cars, as well as in almost every CSR road vehicle. One could cry “foul” and almost accuse the factory of malicious intent, as in the years when Caterham hosted the Cosworth Masters with the CSR racing cars in European Championships the ZF barriers had become scarce, leading the German and French CSRs to be equipped with 45° units, while the English CSRs were all equipped with perfectly suitable 30° units. We came to this conclusion in 2006 when we lost a lot of time against the British in the corners with our left-hand drive CSR racing cars. A look inside the differential lock was able to shed light on this issue. Fortunately, there were still enough ZF spare parts available at the time, so that our white German CSR racing car could be equipped with a 30°/30° specification and was finally competitive from then on. We have rebuilt a majority of originally built left-hand drive CSR racing cars from 45°/45° to 30°/30° ramps, just to emphasize the importance of the locking value of a differential lock. The simple plates had a relatively low coefficient of friction, which led to an increased wear of the plates. For this reason, our disc locks are each equipped with 2 active discs, which act on the passive discs in order to minimize or eliminate friction and thus wear. Friction generates frictional heat, which in turn causes the installation clearance to change due to expansion of the plates and pressure rings and massively influences the viscosity of the differential oil. This goes so far that a differential with a conventional differential lock can no longer be touched after 30 minutes of racing, as there are temperatures in the differential which reduce lubrication to such an extent that even capital damage to the cup and bevel gear occurs. We do not want to go into more detail about the lamella material and the coating, as this would lead too far off of our main point and would not provide any further information about the alternatives on offer. Due to its design, the Tran-X barrier uses significantly smaller plates with a very low coefficient of friction, whereas the TITAN barrier uses slightly larger plates with a high coefficient of friction. Both lose the preload very quickly. 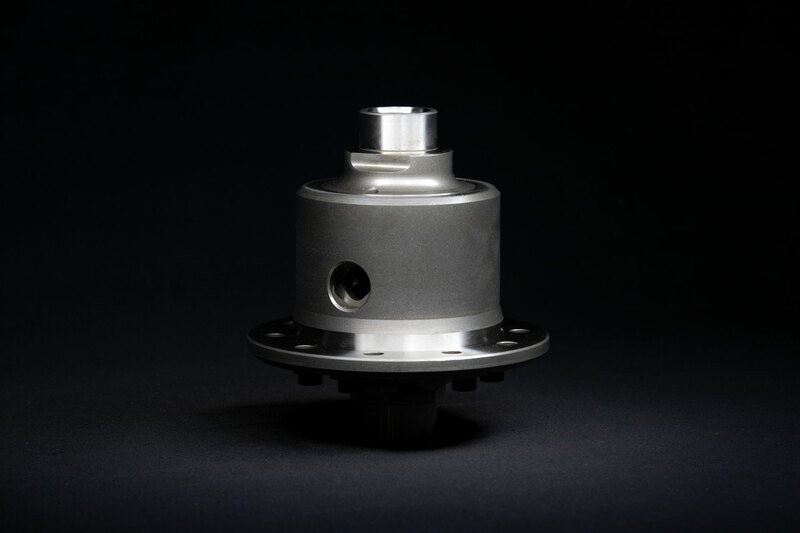 With our lock, we have tested both the 45°/45° and 30°/30° pressure rings with various drivers, always in conjunction with a disk pack with a high coefficient of friction. Even with high-horsepower, top-class Caterhams, the 45° ramp angle is sufficient enough so that the relieved wheel does not spin anymore. Furthermore, it was eventually discovered that the flatter ramp angle of 30° doesn't increase the level of understeer, but you feel the car better at the limit and you have a much more stable rear when braking at the limit. It is possible to get any of the locking-differentials which are currently on the market to achieve the desired levels of locking and traction. It does not lose the preload, therefore requiring very little maintenance in the long run. At the limits, the vehicle remains controllable, as we have massively less wheel load shifting and grip breakage. Low operating temperature due to less friction, less wear and tear and a uniform degree of lockout during operation.